What’s so scary about leasing? One of the most pleasing aspects of being an asset finance provider is seeing the positive impact that the funding we secure for a customer has on their business, their aspirations and their growth. Whether it is spreading the cost of that new IT system (or even software license renewals), financing the fit out of an office space or refinancing existing plant and machinery, ultimately the outcome is always positive. Sounds good right? Well yes, the outcomes inevitably are but that rather begs the question why don’t more businesses use it? I must admit when I first joined the industry and learned about how leasing could benefit a client, I asked the same question. After all, many companies get to unlock significant tax benefits when choosing finance above cash whilst others are able to avoid normal budget restraints, deliver the project they want and start returning benefit to all their stakeholders. Where do I sign right? Perhaps surprisingly, our experience over the last 20+ years is that the ‘technical’ aspects of whether or not to choose finance are not really the issue here. Almost formulaically, you can analyse whether or not the numbers stack up, match commercial requirements to available terms and even do detailed tax comparisons of using capital versus choosing to lease. Most of the time it makes complete sense but, inevitably, there are occasions when it doesn’t. A recent survey starts to give us more of a clue as to where the problem truly lies. The British Bank found that over 42% of UK SMEs they surveyed do not currently use finance and are unwilling to do so whilst 68% agreed that “their aim was to pay down debt and remain free if possible”. Debt is a dirty word in the UK, we puff our chests out and, like a badge of honour, declare we are debt free. We are proud not to use finance. Culturally, that puts us somewhat at odds with many other developed countries. Take, for example, our near European neighbours in France and Germany. No one really considers buying property there until (and then only possibly) retirement whereas, here in the UK, home ownership is seen as one of the key indices of “having made it”. Australians are too busy spending their money enjoying life rather than sinking it into ‘stuff’ whilst our cousins in the USA would raise a Vulcan eyebrow at our determination to pay cash for everything. The reality is that it is actually quite rare to find some who doesn’t use some form of finance in their daily life. Aside from the usual suspects (property and cars), we are all surrounded by finance agreements. From the ubiquitous mobile phone contract, through to digital media subscriptions (Sky, BT, Netflix, Spotify, Amazon, Apple etc.) and even home insurance, all are rental agreements where an element of the amount we pay covers the cost of funds, or interest to you and me. Suppliers work hard to hide these fact from us (that £2,500 interest-free sofa is really a £2,150 sofa with the interest built in) because they too recognise our cultural hang ups. In business, look at how many things are now being offered on a subscription or “as a service” model. Admittedly, slowly and generationally, attitudes are changing. As already mentioned, the principle of subscribing for to all manner of services is increasing popular and demand driven which is a good indication that attitudes are shifting. Wrapped up in our cultural insecurities around finance is also a great deal of ignorance and misinformation which hardly helps to give businesses the confidence they rightly need to do something different than pay cash upfront as they have always done. Awareness of alternative finance products, and indeed providers, is another factor. Survey data has consistently shown that, outside of standard overdrafts, bank loans and credit cards, most businesses are simply not aware of other financial products. Interestingly there is considerable regional differences with, in general, a lower level of awareness outside of London and the South East. We can endorse such findings. Take our Interiors division who specialise in financing the interior fit out for companies looking to relocate or refurbish their existing building. The concept that they can pay for their workspace much like they do their building, on a lease and spread over time is, almost exclusively, something a new client is surprised to find out. When they learn that they can include all their costs (including labour and fees) and many can save significant amounts of tax too, they are even more amazed. The 2016 survey from Wesleyan Bank on SME Attitudes to Finance highlighted that only 24% of SMEs felt comfortable using an alternative finance provider compared to 63% who would borrow from a bank. Fear and ignorance are not exactly great motivators for changing behaviour but how real are those fears? It can appear that way but it really is quite straightforward. Choose a professional advisor, not just one that specialises in asset finance, but one that gives you confidence that they know their onions and is able to articulate the concept clearly and comprehensively. If you come away from that call or meeting still scratching your head, choose again. Too often clients are fixated on a rate, APR or cost in isolation. Although what you will be paying back is important, try to look at the bigger picture and factor in all the benefits that you are getting that you might not get with either cash or, let’s say, a bank loan. Tax savings, the ability to spread costs and the VAT and the opportunity cost of using cash to name just a few. You’ve got plenty of cash? Great – well done! Now how about making that cash work for you instead of sinking it into depreciating assets that only return value over time? Take a look at the list of clients on our website and you’ll see there’s a reason why 97% of FTSE top 250 companies use leasing. Ultimately it is less about how much cash you have and much more about how well you use it. Asset finance is a specialist area and, put bluntly, not a forte for most high street banks. An established asset finance business of reasonable size should be able to provide access to a myriad of alternative funders for you all focused on this arena – just make sure that they are truly independent so that they take a whole of market approach and don’t just offer their own, in-house funding. In our case, the panel is now in excess of 60 and over two thirds of our funders are not accessible to you directly. At the very least, benchmark what your bank can do against these alternatives. Finally think carefully whether or not using one bank exclusively for all your finance needs is sensible for you. Consider the idea of spreading your risk and retaining those credit lines with your existing funder(s) for when you need them. Like many things that, on face-value, look sinister, once you understand how they work, things all make sense and you realise there is nothing to be scared of. I look back on the black and white Horror Double Bill (every Saturday night on BBC Two in the 70s) and remember the terror I experienced as a young boy with only mild amusement and warmth today. Like them, leasing holds no real monsters, just those that we imagine to exist. To varying degrees, all three outcomes ultimately compromise your ability to maximise the benefit to all your stakeholders – be it staff, students or parents. Luckily there is a fourth option. Leasing can transform how you think about your expenditure. By enabling you to spread the costs over time, you can deliver the solutions you want now without compromising your budgets. In fact, many find that not only does leasing take the brake off but that, once they see the low level of repayments, they have headroom to achieve more and their budgets travel much further. So, having established that leasing can be a powerful tool, how does an education professional who is highly skilled, but generally not an expert in asset finance, navigate their way to choosing the best solution for their establishment? A good starting point is identifying a credible leasing provider. There are a number of direct funders accessible to education professionals but asset finance remains a relatively specialist arena and ideally you will want a whole of market approach to ensure that you get the best solution to match your needs so intermediaries, or brokers, are often a good starting point. Look for ones that are well established (we’ve been around for 23 years by way of example), offer access to a wide range of funders, demonstrate experience in the education space and are operationally big enough to provide good support and service. Finally check to make sure they have full permissions from the Financial Conduct Authority (FCA) which is a great indication that they will be working to audited and professional standards. It is easy to do – simple check the Financial Services Register here. Often suppliers themselves will partner with a finance provider and you may be offered a leasing option when obtaining a quote for your project. Just remember that you do not have to use their option and any supplier of note will allow you to use your own leasing partner. You might be surprised by the sheer range of things that you can use leasing for in education. Technology is obviously popular but did you know you could finance software and licences too? How about school furniture, playground and sports equipment, modular buildings, vehicles and access control/security equipment. The spaghetti junction of leasing can be a confusing place so let’s take a look at choosing the right product. If you are a state-funded primary or secondary school (and that includes academies and free schools) then, right now, government regulations restrict you to entering into operating leases only. An operating lease is best described as a rental agreement where you are required to return the equipment at the end of the agreement. Unlike hire purchase agreements, for example, the funder will set a residual value in the equipment (essentially what they believe the goods will be worth at the end of the agreement) so your repayments are typically lower (as they reflect the value of the goods less the residual) but you don’t get to own the assets at the end. Lower costs are obviously good news but bear in mind that the funder will have to be comfortable that the assets can achieve a certain residual value at the end. Recent changes to accounting rules introduced in January this year, (under IFRS16 for those struggling to sleep), may see the government relax these restrictions in future so watch this space. Non-state funded schools, private schools and tertiary education (HE/FE and universities) are not restricted in this way and can choose from operating leases, finance leases or hire purchase agreements. The right choice will be influenced by what the assets are, how long you would like the finance over, what you would like to do with the assets at the end and what you are trying to achieve. One of the most powerful applications of leasing in education has been the rise of the 1-2-1 student device scheme or, as we call it here at Bluestone Leasing, Access Anytime. Over the last decade in particular, there has been a ratcheting tension between the need to embrace emerging and fast moving technology, both as a learning tool and as critical in preparing our youngsters for the world they will ultimately enter, and the demands on education budgets. For many, the concept of providing each of their pupils/students with a dedicated portable device (tablet, notebook, laptop) has been seen as an impractical dream. Access Anytime, and other 1-2-1 schemes, have helped schools, colleges and universities turn those dreams into reality. Essentially most schemes are designed to provide a dedicated mobile device to each student or pupil joining the scheme with the costs (typically device, case, insurances and warranty) covered (in whole or part) by regular parental payments over the 2 or 3 years most schemes run for. Payments are typically modest and parents buy into the positive impact provision of the devices affords, especially in context of the fact that they get to take them home each day and keep them at the end of the scheme. Other alternatives include “bring your own device” or ‘BYOD’ schemes (particularly popular in tertiary education) where students are encouraged to bring in and use their own devices. Be mindful however that this option does carry some disadvantages given the huge range of different devices out there (how are you going to support them all? ), their varied performance and capabilities and, notably, security and safeguarding implications. With every expert predicting a huge rise in 1-2-1 schemes in the UK over the years to come, we have put together a short video for those either wanting to learn more or looking to launch a scheme. You can access the video here. In summary, the best way to view leasing is simply as an alternative, and potentially a powerful one, to paying upfront. In many parts of the world (near-Europe, USA, Australasia), it is actually a preferred option. They might ask their British cousins, why pay upfront for equipment that only returns value over time and depreciates from day one? Avoiding a temptation to comment on the nature of British culture and our attitude to debt, what is clear is that many education establishments have already successfully embraced leasing as part of their strategy to maximise the value they deliver to their stakeholders. Whether you are just looking for a test drive or are eager to buckle up and get on the road, our team of education finance experts are on hand to help steer you on the right track so please get in touch. Bluestone Leasing are delighted to announce that we have signed the Women in Finance Charter, one of the first asset finance brokers in the UK to do so. This represents our unwavering commitment to gender diversity at all levels of our business. Having an intention to ensure the pay of the senior executive team is linked to delivery against these internal targets on gender diversity. The gender balance at Bluestone Leasing is already excellent, something we are very proud of, however we recognise there is still a long way to go in our industry in general. By signing up to the Women in Finance Charter we are committing to continuing with our efforts whilst helping to drive awareness of the need to address the unequal gender balance across our industry. SME Finance: How difficult can it be? With 5.6M SMEs (firms with 0-249 employees) in the UK, representing 99.9% of all businesses, employing 24.3m people and delivering 51% (£1.9 trillion) of gross turnover, the importance of SMEs to our economy cannot be underestimated. A recent Federation of Small Business (FSB) survey suggested that access to finance remains a key concern for small to medium size businesses in the UK with only one in eight seeking external finance. With over 50% of small businesses (50.4%) looking to expand in the next twelve months, despite ongoing economic uncertainty in the UK, the tension between these aspirations and access to finance is worth considering in more detail. Strong survey data, such as the British Business Bank Business Finance Survey, seems to corroborate anecdotal evidence that business leaders and entrepreneurs do not consider fully, or at least are not aware of, their options when looking to grow or invest in their organisations. Outside of standard term bank loans, overdrafts and credit cards, most SMEs have limited awareness of other available products and, more worryingly, their access to and awareness of providers of such products is significantly lower still. This is reflected in just how many SMEs still rely, almost exclusively, on their own bank for access to finance. A 2016 “SME Attitudes to Finance” survey by Wesleyan Bank demonstrated that 63% of SMEs would feel comfortable borrowing from their bank but this drops to 24% with regards to using an alternative finance provider. Around 80% of bank applications are successful (although this drops to just 50% for first time applicants) but that still leaves about 80,000 failed applications each year and a funding gap of £3.2bn in the UK. In this context, it is perhaps understandable why so many economists regard this gap in funding as a major brake on prospects for SME growth in the UK. It has been suggested that perceived difficulties in securing alternative finance is also at play in the minds of SME leaders. Again, the evidence seems to support this with the British Business Bank survey reporting that 56% of SMEs described their perception of obtaining external finance as ‘difficult’. It is reasonable to assume that demand for alternative finance is artificially suppressed amongst these businesses with a subsequent impact on SME opportunity for growth or assistance with cash flow. Fortunately, the reality is much more positive than the perception and, for those prepared to investigate options other than their bank, there are some real opportunities to reduce their reliance on their primary funder and to access exciting alternatives often on much better commercial terms than their bank can offer. But where to start? As a starting point, my advice to any SME is to find an expert and specialist finance partner to work with. Often, for investments, manufacturers and suppliers will be able to recommend potential providers whilst industry bodies like the National Association of Commercial Finance Brokers (NACFB) can help too. Look for a partner that is well established in their field and financially strong –good indications that they have the experience, systems and skills you should be looking for. Make sure that they are fully accredited – The Financial Conduct Authority (FCA) took over from the Office of Fair Trading back in 2014 and they operate a robust permissions system which all credible players will have in full. Be wary of operators acting as agents of others and not actually having full FCA permissions in their own right. It is increasingly important to make sure that the provider can offer a true “whole of market” approach and is entirely independent. Although most companies in the field run their “own book” (where they provide the finance rather than a third party institution) this should not be artificially promoted and should be balanced by an extensive and broad funding panel. For instance, in our case, our own book accounts for less than 5% of the overall business we write, good evidence that our solutions are driven by the client need and not ours. Meanwhile our funding panel is approaching 60 banks/funders of which over two thirds are not directly accessible by UK businesses. Look for a partner who can offer you this level of true added value. For asset finance, choose a partner that can demonstrate a broad base of assets that they can support and knowledge of your industry or sector. For example, we have specialist divisions such as technology (where we even fund 100% software projects), interiors (financing the entire costs of fit out including labour and fees) and Health & Fitness (everything from gyms through to medical equipment). Ideally, look for a range of debt finance solutions (such as asset finance, cash flow finance, VAT/tax loans, bridging finance etc.) from your chosen partner as the relationship you are forming should be one that will last for the long term. Ideally your partner should be able to support you with different facilities as the needs of your business develop and change over time. Flexibility might not seem so important at first when you have a specific need in mind, but it will be at some point. Last, but not least, make sure you can work with them. Trust is important in all business relationships but never more so than when dealing with finance. Do they take time and effort to get to know you, to understand your business and make sure they maximise the chances of securing the facility you need? If it’s just about the numbers (or worse still just the dreaded online portal), think carefully if this is really what you are looking for. Although success can never be guaranteed, spending a little time to get the right partner will absolutely make a difference. We are really proud that over 92% of applications that we propose are successful and, over the last 23 years, we have secured facilities that have helped over 10,000 UK SMEs protect their cash flow and achieve their growth aspirations. For our SMEs, securing finance through alternative funders other than their bank is pain-free, speedy and on the best terms available in the market. If you would like to know more about how we can help you, we’d love to hear from you. WLTP – What does it mean? WLTP stands for Worldwide Harmonised Light Vehicle Test Procedure (trips off the tongue right?!) and is a new global regulation test for measuring the level of air pollutant, CO2 emissions and energy consumption in light duty vehicles – cars and vans to you and me. It applies to all petrol, diesel, electric and hybrid vehicles and replaces the NEDC (New European Driving Cycle) test that has been in place for the last 20+ years. After recent huge criticism of NEDC (remember diesel-gate?) and manufacturers accused of misstating emissions figures and misleading customers, authorities needed to react to restore faith in the system. To underscore that point, it is believed that most cars on sale and on the roads in the UK today do not meet their claimed fuel economy figures by as much as 25% or more. WLTP tests are carried out in a laboratory which helps to ensure accuracy and repeatability and introduces much more representative testing conditions based on data from “real driving” which will provide a more accurate basis for measuring emissions and calculating a vehicle’s fuel consumption, providing more detailed and realistic vehicle performance data. The WLTP tests place more emphasis on the mass and aerodynamics of the vehicle, the rolling resistance of the tyres and the options fitted to the car including alloy wheels, tyres, panoramic roofs, towbars, roof bars, active cruise control, air conditioning and autonomous emergency braking. This means that a vehicle’s CO2 value can only be finally determined once options have been chosen, even for the same model of car. So, testing will become more accurate and as a consumer you will be better informed – so far so good right? Maybe, but there are a couple of key things that you should be aware of. Firstly, all new vehicles MUST be compliant with the new regulations by 1 September 2018. So what? Although manufacturers have been aware for a long time of these changes coming in, many are simply not ready and certainly won’t be come the beginning of September this year. After the 1st September, the manufacturers legally cannot sell the non-compliant vehicles they have in stock and could actually find themselves in the situation that they may have to scrap them. So far so good? That depends. If you currently drive a company car then a key date for you will be 6th April 2020. This is when the government will be using the results from WLTP testing to calculate new Benefit In Kind (BiK) figures for company car drivers in the UK. Remember the CO2 emissions of your vehicle are a key component of this calculation. Essentially – the higher your CO2 emissions, the more you will be taxed for your company car based on your tax rate and the cost of the car itself. So, driving the same car that you have been driving up to 6th April 2020, you could find yourself paying a significant amount more in company car tax after this point. As with all these things, GDPR, the millennium bug (for those that remember that! ), the key message is don’t panic! The main thing is to make sure that you are making an informed decision about what you are doing now and how this could change in the future. Bluestone Leasing are delighted to announce that we have gained Cyber Essentials accreditation as part of the company’s ongoing commitment to cyber security best practice and assurance. Set across three days 22-24 May 2018, Clerkenwell Design Week (CDW) returns for its ninth edition, hosting the best in design from the UK and beyond, and featuring a wide range of talent from the area from young entrepreneurial start-ups to well established design practices. As the annual focus for London’s leading design district, the festival programme has been tailored to reflect the unique nature of this vibrant London hub, home to a plethora of creative businesses, design consultancies, showrooms and architectural practices. 2018 will again play host to hundreds of fringe events, showroom presentations, workshops, talks and public-facing installations all with design at their heart. Events run over three days and follow a distinct trail north to south from Spa Fields down to Farringdon linking together several exhibition spaces and a series of specially commissioned installations. Each year, Clerkenwell Design Week displays new projects and commissioned installations located within high profile spaces across Clerkenwell. Working with leading names in design, engineering and architecture, these projects aim to bring spectacle and energy to the district whilst pushing the boundaries of design concepts, process and material capabilities. This year, sustainability is a key theme with several participants and projects addressing this trend. Integral to the festival are the local resident design showrooms, many of whom partner with CDW, providing an array of stimulating events from talks and workshops to major installations. Over 90 companies will be participating in CDW 2018, including high-end furniture, lighting, kitchen and bathroom brands alongside specialist manufacturers. 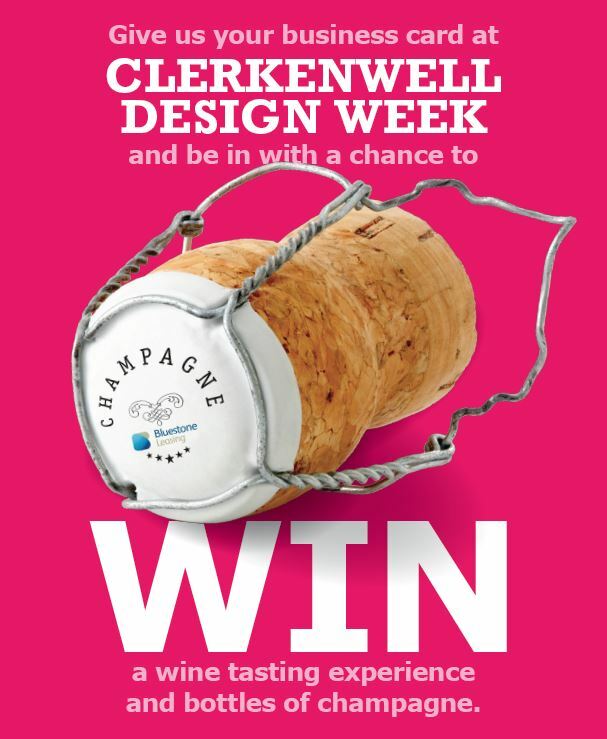 Our Interiors team will be attending CDW every day, to be in with a chance of winning a bottle of champagne, just hand any of them your business card to be entered into a draw – one lucky winner will also win a wine tasting experience! We are looking forward to seeing existing and new partners.